In my Sharepoint list, images (via URL) display in full size (HUGE). Is it possible to change the display size of images in "Quick Edit" view in Sharepoint list. OR (even better) is it possible to have the images display as the url when in quick edit view? OR is it possible to constrain the Row height / Column width, so that I can still keep using the Quick Edit view? 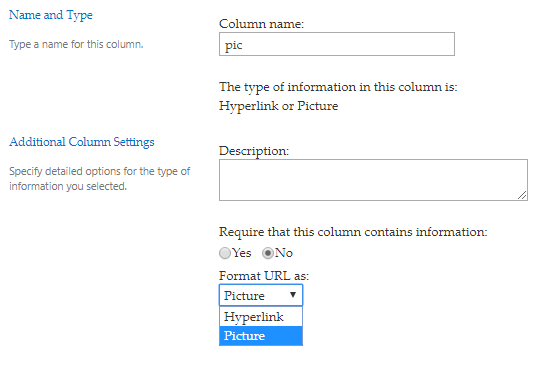 I assume that this question is related to your previous one In a Sharepoint List: Display an Image (field type "Hyperlink or Picture"). Yes, you can change size of image in Quick edit mode. It is similar to Column formatting in Modern experience. In classic experience (used in Quick edits) it is called Client Side Rendering (CSR). 2) Upload this file to Site Assets to the site collection where you have to image column. Note: this file can be placed anywhere you just have to change the path in it. 3.1) Download an install SharePoint Online Client Components SDK. It will copy some DLLs that are needed to connect to the SharePoint using PowerShell. Set-JSLink -SiteUrl "https://tenant.sharepoint.com/sites/ABC" -ListTitle "List title" -ColumnTitle "Image column" -JSLinkUrl "~site/SiteAssets/photo.js"
5) Open your list and use Quick edits. Not the answer you're looking for? Browse other questions tagged list image image-display quick-edit or ask your own question. How to edit row height in the list?